Aquabot power supply kept blowing fuse. (I was using 2 amp fuse, looked like original) I checked voltage out of supply, was ok, but voltage at motor terminals, under putty, was intermittent. 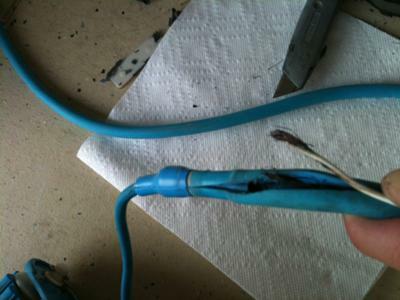 I suspected power cable, so I sliced cable open,(with the power off of course!) starting at the handle, and sure enough, there it was, an internal short, right where the cable attaches to the handle. Cable is $125! (no shipping charge if you order from aquaquality's ebay store) I have had my aquabot for 8 years now, and besides new foam brushes and belts 2 years ago, this is the first problem. We have a yellow lab that is constantly in the pool, and we couldn't maintain it without the aquabot!